Our copiers can output hundreds of pages per minute, saving you valuable time. Your staff won’t need training on how to use the intuitive touch-screen features. Your business will be able to reproduce professional, glossy brochures, agendas, conference proceedings, sales materials and technical documents, and training coursework. Our copiers also make it easy to electronically archive, share and retrieve documents. The newest copier features can improve communication between differefnt office locations or allow you to send files to clients and customers directly from a machine. This saves your business time and money. 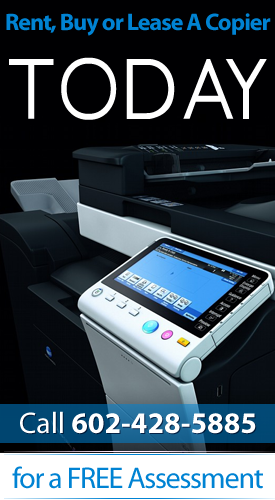 With Arizona Copiers, you can scan, fax and print documents using all in one copiers. These new high-tech features don’t require your office staff to undergo special training classes or develop new skills. Arizona Copiers is an affordable choice for all your business needs in Maricopa County. If you are looking to rent a copier for a short period of time, ask about our rental plans. We are your one-stop copier company in Maricopa County. We sell a variety of Konica Minolta and Sharp copiers which fit any size office space. Whether you are buying a copy machine for the entire office, or just yourself our prices are affordable. Keep up-to date with the latest high-tech printers, scanners and copiers by leasing a copier in Maricopa County. Arizona Copiers carries a wide range of high-performance digital copiers and laser printers that work overtime so you are more productive. The space-saving design can event fit in your home office or home-based business. Do you telework in Maricopa? You might benefit from an all-in-one copy machine to keep you in touch with the office, clients and more. If you need to find a copier company in Maricopa County to get your business up and running quickly, talk to us!Our copy machines can handle repeated use, larger size documents, networking, two-sided printing for your small business. If you are trying to learn a new business, start a business from home, or just expand to a new location, contact Arizona Copiers for a free copier quote. Reliable copier equipment can help your business get the competitive edge it needs to succeed!